The Koran says non-Muslims are the worst of all creatures (98:6), so it should be no surprise the Koran and the Sunna (example of the Islamic prophet Mohammad) allow and oblige Muslims to lie to non-Muslims. All authoritative Islamic law (sharia) obliges jihad until the world is under Islamic rule. Therefore, when Muslim leaders are speaking to non-Muslims about Islam, there is a high probability they are lying. It is not just a few “radicalized” Muslims who want sharia and all that goes with it. At the Norway Peace Conference, the founder of Islam.net and host of the conference Fahad Qureshi polled the audience of hundreds of Muslims who unanimously raised their hands indicating they want sharia to be the law of the land to include stoning for adultery, death penalty for homosexuals, and everything that comes with it because their law comes from Allah in the Koran and the example of their prophet Mohammad. A 2013 Pew poll reveals most Muslims want sharia to be the law of the land, and most of the Muslim world believes there is only ONE version of sharia – not the “thousands of interpretations” Islamic advisors to the U.S. government have lied about for the last 15 years (and beyond). Specifically, a sampling of 10 countries/areas of all the Muslim areas polled – Afghanistan, Bangladesh, Egypt, Pakistan, Indonesia, Iraq, Jordan, Morocco, Nigeria, and the Palestinian Territories – reveals out of 785 million Muslims living in these areas, 617 million told the Pew pollsters they want to live under sharia (Islamic law). For those of you without calculators handy, that is 79% of the Muslim world. That is a big number. So is 617 million Muslims, and that’s just a sampling of the world’s Muslims. The majority of the Muslim world wants the sharia that: commands pagans to convert to Islam or die; commands Christians and Jews to convert to Islam, submit to sharia and pay the non-Muslim poll tax, or die; calls for apostates to be killed; identifies woman as property; and commands jihad as perpetual warfare until sharia is the law of the land over the entire world. This is also the sharia that obliges Muslims to lie to non-Muslims. As UTT’s own Chris Gaubatz experienced in his recent encounter with a sharia scholar and Imam from Texas, they will lie to your face and then feign offense when you call them out on their lies. Think about this the next time an Islamic scholar, leader of an Islamic organization, the local Imam, or any prominent Muslims are talking to you about Islam. 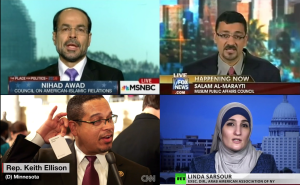 If a special prosecutor appointed by the Acting Attorney-General finds that a federal judge, two governors and two United States Attorneys in the States of Washington and Minnesota have conspired to ignore U.S. immigration laws in order to enable sharia-adherent alien Muslims to enter the country in defiance of an emergency presidential directive created for the express purpose of protecting national security, and the lives of the American people, he should seek federal indictments of all five on charges of committing and abetting subversion, which in light of Government Exhibit 003-0085/3:04-CR240-G: U.S. v. HLF, et al is clearly the case. 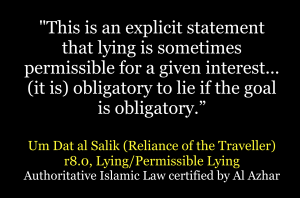 Excellent comment, the statement from the Reliance of the Traveler/ Um Dat al Salik…r.80 about permissible lying to support islam, would find that misinformation about the “peaceful islam”, is cluelessly supported by the media…imams claim peaceful, tolerance to the unbelievers and talk about conquering to each other. Maybe President Trump should require all media authorities/ to be informed about the muslim organizations across the country that has the purpose to dominate and control the information about islam when necessary to support the infiltration and eventually terrorism. Reading the Koran and Reliance fo the Traveler should be required reading to make decision that will protect the U.S. citizens from terrorism…it is a political system with it’s own laws, sharia that is is unconstitutional to support. Will the courts support us, if not shame, they should not support ignorance of the goal to conquer and slaughter, if the courts don’t see it happening world wide they are blind.